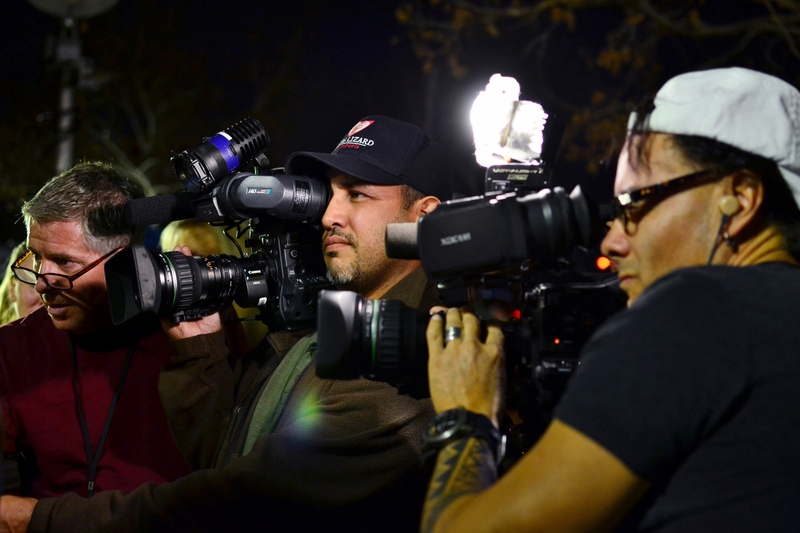 Isla Vista shooting resurfaces old debates about gun control, mental health and … the media? 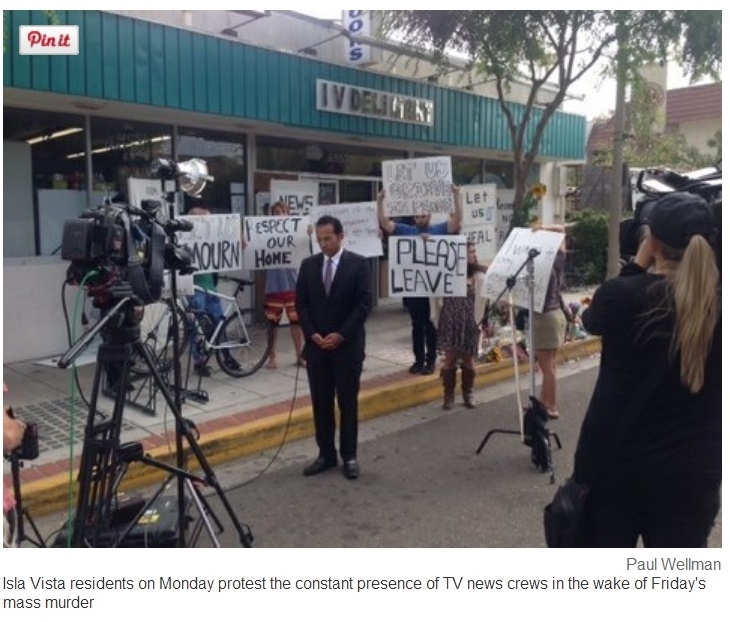 A screenshot of a Santa Barbara Independent photograph by Paul Wellman showing Isla Vista residents protesting the constant presence of TV crews in the area, according to the photo’s caption. A massacre in the college town of Isla Vista, California, over the weekend has renewed well-oiled debates about gun violence and mental health issues in America. But it has also raised another question: How should the media cover these tragedies? It is a question that often gets asked in the wake of tragedies of this magnitude — seven were left dead, including the gunman, and 13 injured in the Friday night attacks — but hardly ever this quickly, with bullet holes only just being dislodged from the scene of the shootings and with victims still recovering in the hospital. For many news organizations, the initial report of a shooting is nothing out of the ordinary: In the Los Angeles region, an hour and a half south of Isla Vista and Santa Barbara, a photographer or TV cameraman is often at the scene of such reports within the hour, if not sooner. That was the case with the Isla Vista shooting, as photographers from the Santa Barbara Independent and UC Santa Barbara’s student-run newspaper The Daily Nexus, among several other media organizations, were at the scene late that night. The Daily Nexus has in the past few days since meticulously covered all aspects of the story, which happened just blocks from the campus, in a magnitude and quality that rivals that of the Los Angeles Times. The staff needed time to mourn and process the tragedy, the op-ed added. Media critics were quick to pounce on the no-reporting stance of the newspaper, with some, such as Calbuzz’s Jerry Roberts, saying the paper was skirting “its role as a community news source,” as cited by media critic Jim Romenesko. The LA Times alone, for example, had at least two reporters and seven photographers covering the story in Isla Vista over the course the three-day weekend, according to an analysis of its reporting and photographs. Of course reporting from the scene is necessary, as it is the media’s job and responsibility to tell the account of a story to those who were not there, and this, being a national story, carries an even heavier importance. The Bottom Line should be commended for its boldness in standing apart from the crowd by not heavily reporting the massacre, as it was attempting to minimize the emotional harm to its staff. And besides, it’s not like interested residents don’t have half a dozen other media outlets at their fingertips to get the story from anyway. By Tim Worden. Published May 27, 2014 at 2:45 p.m.